(Nanowerk Spotlight) Doping, the process of adding impurity atoms to semiconductors to provide free carriers for conduction, has been pivotal to microelectronics since its early stages. In particular doping germanium at high concentrations to make it highly conductive is the subject of intense research, because it lies at the heart of novel developments in integrated silicon-compatible lasers and quantum information processing devices. Researchers have now demonstrated a method to densely pack dopant molecules on the germanium surface, which then self-organize to form molecular patterns with one phosphorus dopant atom every two germanium atoms. "This densely packed layer is confirmed by theoretical calculations of the reaction pathway energetics which describe the initial stages of how the individual dopant atoms incorporate into the germanium surface," Giordano Scappucci, a Senior Research Fellow at the School of Physics at the University of New South Wales (UNSW), explains to Nanowerk. "Such atomic scale insights provide crucial information for the future development of efficient doping processes in germanium based electronics." The key finding of a new paper in the August 13, 2012 online edition of Physical Review Letters ("n-Type Doping of Germanium from Phosphine: Early Stages Resolved at the Atomic Level"), first-authored by Scappucci, is that when you deposit phosphine molecules on a germanium surface, they naturally form molecular patterns with one phosphorus atom every two germanium atoms that densely pack the surface. The research team, which included scientists from UNSW, the University of Sydney, and Universita' di Roma Tre, studied these chemical reactions at the atomic level with a scanning tunneling microscope and supported their findings with theoretical calculations. 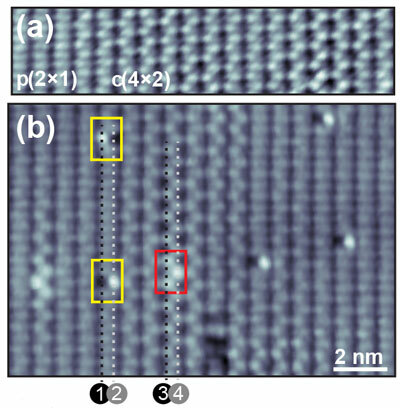 This combined experimental and theoretical study into the chemisorption of phosphine molecules on the germanium surface is a critical step of the atomic-layer doping process. "Our atomic-scale insights are crucial for the development of efficient doping processes in germanium, a difficult task to achieve with mainstream technology," says Scappucci. The researchers at UNSW are pioneering the study of the phosphine/germanium material system and in a previous Nanowerk Spotlight ("Nanoelectronics with germanium") we reported on their efforts to fabricate germanium-based nanoelectronic devices. In contrast to silicon, the team found that upon adsorption on the germanium surface, phosphine molecules dissociate producing one and only one species – PH2 – that densely pack the germanium surface. "Our goal is to understand at the atomic level the doping process of germanium from phosphine molecules and consequently engineer efficient doping processes for germanium," says Scappucci. "This study shows that when deposited in ultra-high vacuum, phosphine molecules are very promising dopant precursors to obtain high electron concentration in germanium with atomically abrupt profiles." The team is currently pushing this research into two directions: One is to transfer the doping technology from the university lab to a chemical vapor deposition (CVD) system, which is industry-compatible; the other is to maximize the electron density in thin germanium films made of stacked phosphorus layers. Dr. Scappucci received a 2012 University of New South Wales GoldStar Award for a research project related to the paper.